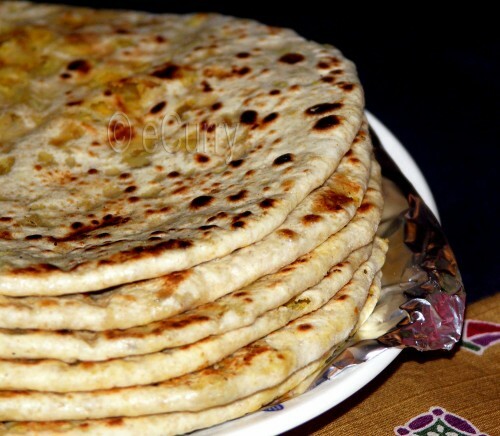 Dal(Lentil) paratha/flat bread is something which I learned from my grandmother. My grandparents lived only a few minutes away from our home. And it would be often that my grandpa would walk by with a bag of hot, freshly made parathas and a bunch of flowers for me. The recipe had been handed down to my mom and then I started making them. Everytime as the smell wafts aound the house I remember my grandma & my mom (none of them are with me today) and all the childhood memories. But even now I like hers the very very best. Be it during large family get togethers or some festive ocassions, I remember her sitting by the old Indian style clay coal oven ( no she did not have gas stoves at that time..), rolling them, filling them and then frying them on a black cast iron skillet,and stacking the parathas making a tall heap on her side. I could see the red glowing coals under the skilet. The heat of the burning coal felt so good during the chilly winter nights. Sometimes I would sit by her and cup my little palms, and ask for the dal filling. The intense flavor of hing/asafoetida combined with the ajwain, ginger and red chilli contributes to the sensational, spicy & mouthwatering taste of these parathas. There could not be a more perfect combination. I eat the crumbly warm filling just by itself even now. My grandmother’s parathas would be so thin & flaky and yet no holes in them as if her nimble hands had some magic in them. Food would be served, and I would see the glitter in everyone’s eyes, the exclaimations..”Oh!! dal parathas..!” & soon they would be all gone. We would also frequently carry these whenever we would be travelling by train. They are dry and easy to eat and did not require any special storage other than just wrapping them up and then serving them on paper plates. The dal/lentil used here is the Chana Dal, which is the Bengal grams/Black Chickpea husked & split into half. Chana dal or Cholar Dal as it is called in Bengal, is very popular not only in West Bengal but all over India. It is prepared in various different ways, just by itself as a dish, or with vegetables of even meat. Ajwain has a sharp hot taste on the tongue when crushed and it is most often used with lentils as the seeds have excellent digestive properties. Dal/Lentil/Legume is high protein, so this Dal paratha is a wholesome nutritious meal by itself. Serve them with any side or just by themselves with salad & yogurt/or Raita… this will cool off the heat of the parathas. Wash and soak chana dal for 2 to 3 hours. Add salt & turmeric & 2 cups water and simmer it in a covered pan till they are soft & most of the water is gone. Alternatively, you can pressure cook it. Add 3/4 cup of water and bring the cooker to full pressure and after the 3rd whistle, switch the heat off. Open the cooker only when cool. Crush the ajwain in the palm of your hands. These releases the flavor of the seeds. Heat oil in a pan. Add the hing/asafoetida, Cumin, Ajwain/Carom Seeds. When they start to sizzle, add the Dal/Lentil, ginger paste, sugar & red chilli powder. Fry while stirring often ( so it does not stick to the bottom), till the dal/lentil is of crumbly texture and all the water has dried up. Keep the filling aside. Mix wheat flour, oil/ghee, baking soda, Ajwain/carom seeds(again rub the seeds in the palms of your hand, or crush it with a rolling pin) and salt. Mix the oil in to form lumps/thick crumbs. Then add water little by little, knead and make a stiff dough. Cover with a towel & rest the dough for 30 minutes. Make small balls of the dough. Take one dough ball and roll it out with a rolling pin to a 4″ diameter. Take about 1.5 tablespoon of filling and place in the center of the rolled out dough. Bring together all the sides in the centre and seal tightly. Dust some flour and then lightly flatten the dough with hand. With a rolling pin, roll out carefully to make a circle about 7″ diameter. Cook on a griddle using a little oil, on medium heat. Flip and cook evenly on both sides, till it has golden brown spots on both sides. Enjoy these for breakfast, lunch or dinner with a side or just with a bowl full of salad and yogurt/raita. Sending this to Think Spice: Think Carom started by Sunita & hosted this time by the Singing Chef, My Legume Love Affair: Sixth Helping – Hot & Spicy hosted by Suganya of Tasty Palettes, originally started by Susan of the Well Seasoned Cook, & to Winter Treats hosted by Trupti. i have been wanting to try this dhal paratha for sometime.. looks great and delicious. I usually make dal parathas with left over dal Soma. Your stack looks great. Amio kori, kintu sheta beshir bhag shomoye cholar dal hoye na. Wow, the paratha looks awesome! Nice instructions! Congrats on winning the challenge. Your paraths looks great and delicious Soma….you have a very good blog!!!! Indrani, amar dida egulo ke “dal puri” bolto. Somehow they got to be parathas… now. Yummy parathas Soma..great pictorial too..I too make a similar stuffed dal paratha using moong dal..absolutly delicious!! Divya, I have never tried with mung dal. May be next time ..
Wow makes me hungry. Wish i could eat them now. You are welcome to come over. Looks really delicious…awesome clicks Soma…COngrats on winning the challenge event.. Thank u so much Priya! Now , this is something that will really be useful to me. I am terible at making flat breads. just loved your description. will try it soon. 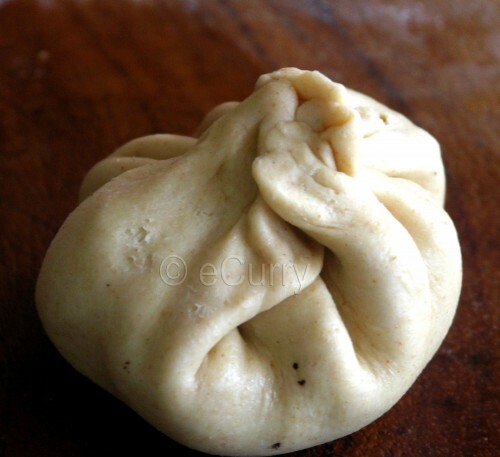 and I wanted to add, your chapathi dough looks soo soft and elastic, almost like one made of maida. Where do you buy your whole wheat flour ? Priya, I buy the regular Indian store whole wheat (atta) & I mix whole food store or any store whole wheat to it (50 -50 ). Its impossible for me to work with maida here. They are like elastic. U roll it out, turn the other side, & they shrink to a miniscule circle:-) I use all purpose flour for baking only. I think the flash adjustment is making it look so white…(see the dal filling, that came out very light too.) I see that now. Enjoyed reading about your grandmother Soma. You have put it so aptly that they had magic in their fingers. Their cooking using coal etc would be so tedious, yet the taste lingers on. I have tried the sweet chana daal stuffing (puran poli), but not this one. I need to try this. Supriya, those days seem so far far away… I am not very fond of puran poli, only becoz its sweet. its more like a dessert for me, where u only have a small serving. I have tried the sweet version with channa dal and jaggery, but this is completely new, yet very tasty I would think. hey thats my fav with kheer! Tumi bangla bolte jaano ki kore? those parathas look so soft. never thought we could stuff dal. looks so good. very wholesome for sure. 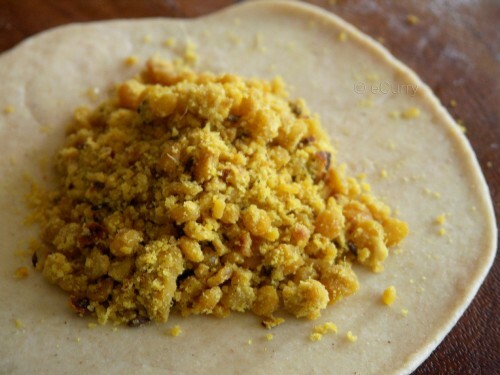 Using daal stuffing in paranthas is somethig I have learned from my mom too. These look lovely! 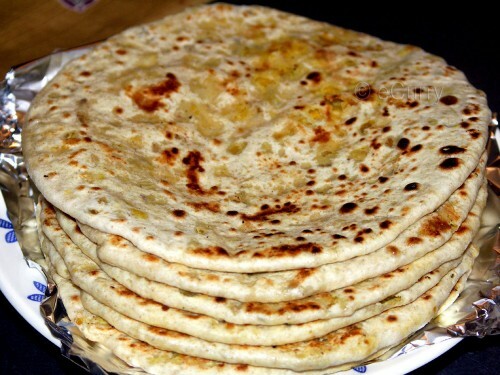 The stack of hot paranthas looks so mouthewatering! We love these too! Your pile of parathas look terrific, Soma! I love Indian stuffed breads alot. They are similar to what we call feseli or gutab in Azerbaijan. Your daal version sounds delicious! This is my first time here. You have a lovely space. Parathas look perfect n fluffy. this is great, i havw usually seen these dal paranthas/puris made with maida/white flour. Good to get a whole wheat version, that too one that has been passed down three generations! I make these parathas too. But I also add cilantro to the filling. Perfect winter fare!! Would like to know if you mean baking soda or baking powder and do you use very hot water. I make dal puris they come out soft but NOT light. I use 1 tbsp ghee, 1/2 cup of boiling water, 1 tsp baking powder for each cup of all-purpose flour. I recently used 1 tbsp of ghee made by melting marg. at 80% veg. oil for each cup of all-purpose flour. The dough did not stretch out well when I rolled it and it did not come out soft and light. Your input would be really appreciated. i was planning to make adai next week. But – thanks 2 u – i shall make the dal filling on saturday and then on the week – all i got to do is make the parathas !!! shall serve it with some cut cucumbers to add the greens to the diet… thanks soma for the protein rich recipe. we call these meeti roti — my mom spreads warm ghee on it. ahhh the memories…. Oooh, I love these! Yours look so perfect too. Yummy! Snap…I’ve been looking around for this for a long time! Thanks alot, especially with the pictures! These sound delicious! I am on the lookout for more lentil recipes, since they are so healthy and this looks like something my kids would enjoy if I tone down the heat a bit!